When you buy but regret your purchase later? There are instances where we shell out few hundreds of dollars to buy something out of necessity. However, our choice product might not live up to the expectations leaving us in regret, frustration and anger. All we end up doing is to see if we could negotiate with the company or the seller and get a replacement or refund. What happened with Tuft & Needle Co-founder? But the case with Tuft & Needle co-founder is in fact very different. The newlywed couple decided to start their own mattress company after being disappointed with their brand new foam mattress, their first big buy post their wedding. Their journey started on a bootstrap budget and limited to selling only online without any retail outlets. However, their constant hunger for providing the best experience at an inexpensive price has what made Tuft & Needle a leading seller in mattresses segment. And all this, within a very short period of time. They constantly gathered feedback from their customers, tested their prototypes multiple times, made timely changes to further enhance performance and shipped delivery directly to the customers doorstep at reasonable prices by cutting off all the middle men charges. Tuft & Needle has employed a simple 2 layer construction. This type of construction might not necessarily provide precise level of plush / firmness of a premium mattress. Perhaps, Tuft & Needle’s motto was to include a simple construction, at an inexpensive price, that is primarily focussed to meet the needs of majority. Made from polyester and Tactel blend, this cover is in fact a perfect choice for temperature regulation, dries up pretty quickly than cotton fabric. Sweat or moisture, if any on the top surface, dries up faster. It is stretchy, thin and offers enhanced breathability thus keeping the top surface always moisture free and supports the layer beneath in maintaining overall cooling effect. Top Comfort Layer – Why Tuft & Needle developed their own proprietary layer? In almost all other mattresses this layer is gel memory foam layer, infused with either cool gel or cool beads. It's again supported by another one or two more layers with increasing density to complement both the top gel layer and high density support layer beneath. However, Tuft & Needle after extensive research have developed their own proprietary layer that removes the need to have multiple layers intended to offer precise level of firmness. This design of having a single top layer also cuts short the overall cost of the mattress while maintaining the desired level of plush and firmness on the top surface. Made from poly foam, it is 3 inches in thickness and responds/returns to normal shape pretty fast, just like latex foam layer. Like all mattresses, Tuft & Needle has put a 7 inch high density poly foam layer as the base. This layer perfectly holds the mattress from sliding further downwards. On a scale of 1 to 10, the firmness of this mattress stands anywhere between 6 and 6.5. One reason why some people might say that the mattress is on the firmer side is because the top comfort layer is immediately followed by the high density base layer. There is no intermediate layer that works as transition layer to avoid sleepers from directly coming in contact with the bottom base layer. Read below to know the exact details. However, most other mattresses in the market intentionally keep the firmness level at 6 so as to cater to a wide range of audience. They try to add some extra comfort on top surface by including one or two layers in between the top and base layers as transition layers. It is although a good idea to include extra layers to provide precise level of comfort but it in fact adds some unnecessary cost that is again pushed to the customer. This is where Tuft & Needle has removed the intermediate layers thus cutting extra costs and providing more or less the same level of plush/firmness like most other mattresses. Firmness level 6 is what sells extensively in the market and Tuft & Needle design has precisely targeted this segment of audience. An intelligent design to benefit consumers!! I followed the same universal method of basic hand test. I pressed my palm on the top layer without putting too much of pressure. The mattress sunk by around half an inch to one inch. This is the same amount of pressure our head and lower body put on the mattress. Upon removing my hand, the top layer returned to normalcy within couple of seconds showing that the proprietary layer is in fact quick and quite responsive. 0.5 inch to 1 inch is an ideal sink to call it medium firm/plush. Next, I applied little bit more pressure sinking my palm deep into the top layer. This time, I could feel the bottom base layer which didn’t really allow me to sink further. The indents were 2 to 2.5 inch thick. This is equal to the pressure our shoulders and hips put on the mattress. 2 to 3 inch sink is mostly due to the heaviness of our shoulders and hips. But as the bottom layer is able to hold us from sinking further, the top layer offers right amount of sinking to call it medium firm. Instead of testing with medicine balls, I myself sat on one side of the mattress for 10 minutes with the empty box standing vertical in the middle of the other half of the bed. When I got up I noticed that the mattress sank up to 2.5 inches (I am on the above average side weighing 176 lbs). However, the box on the other side neither tumbled nor swung sideways. There was just a slight sway while getting up but the box didn’t fall in the direction I got up. Next I slept on the mattress but this time kept the box horizontal. I moved on my sides and back few times but didn’t really notice any major movement or the box slide towards me. There was some minute movement but that may be because of the light weight of the box. However, anyone weighing over 80 lbs might really not notice any substantial movement from other side. 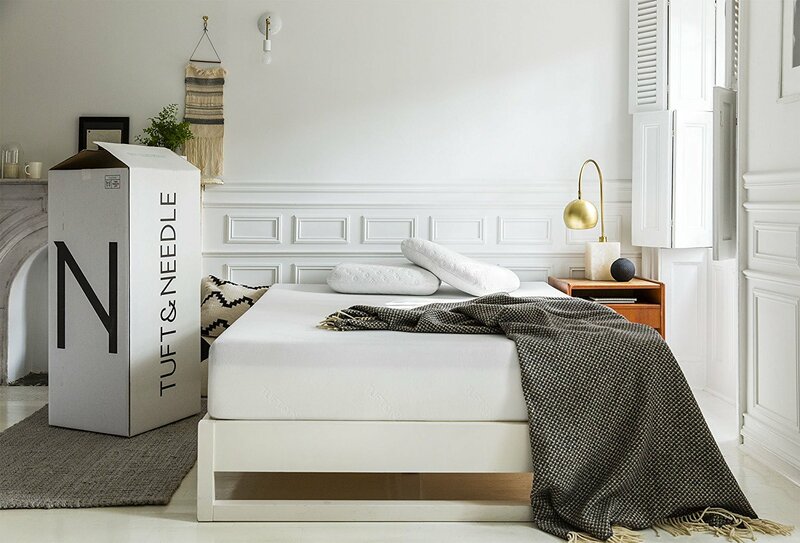 On the whole, the motion isolation offered by Tuft & Needle mattress is pretty much satisfactory, very similar to other premium mattresses in the market. I lent the mattress to a friend of mine for regular basis use. After nearly a month, I went and tested it again myself to check for any permanent indents developing on the top and base layers. If any mattress carries deep permanent indents, means the base layer has failed and overall the mattress is not satisfactory. However, in case of Tuft & Needle, the entire mattress surface area, especially the area around hips and shoulders didn’t show any indent marks. It was intact like a brand new one with the top 3 inch layer responding and returning back to its original shape within 2 to 3 seconds after pressing and removing palm. The base layer was the same again and didn’t allow my hand sinking deep into it even after applying greater pressure. With the mattress offering firmness around 6 on a scale of 1 to 10 proves that it does not really result in back pain for regular sleepers. Mattresses that are too plush sink in deep and are a cause for back pain. 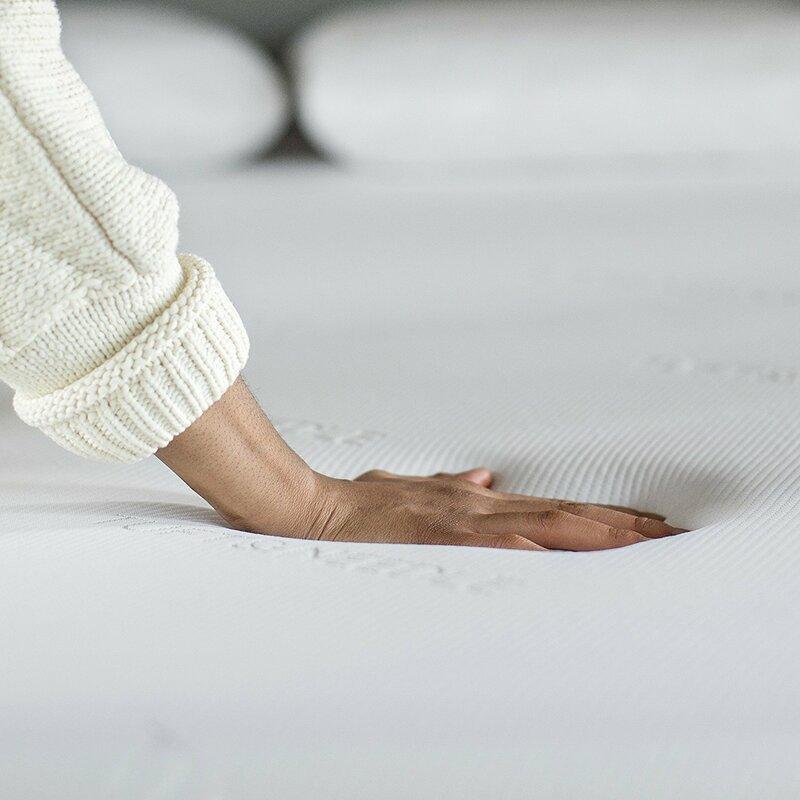 Additionally, as Tuft & Needle does not include plush intermediate layers but directly has high density layer beneath the top soft layer, the mattress does not result in back pain even to sleepers who weigh above average. Like all other memory foam mattresses, Tuft & Needle also carries mild odour while inflating. However, the smell doesn’t long last and vanishes within few hours. You will surely notice that the smell does disappear well within half a day at the maximum, post inflation. 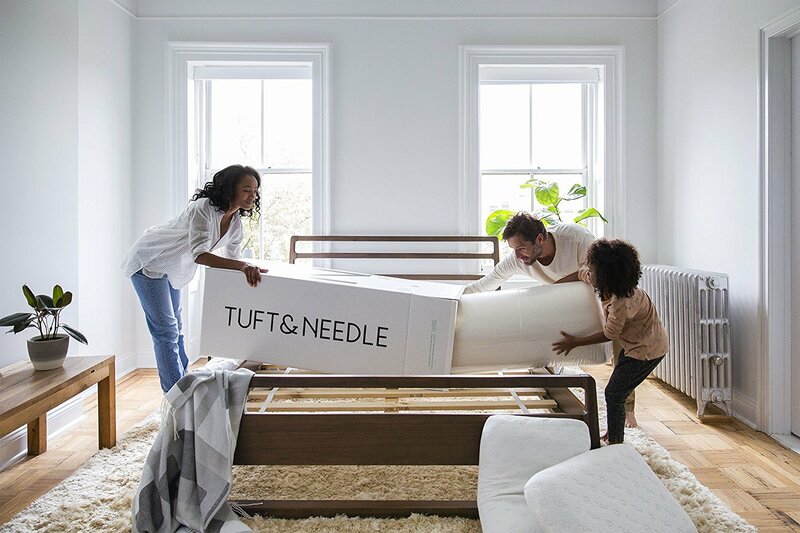 Tuft & Needle mattress inflates to its full size of 10 inches well within a day. However, it is best advised to leave the mattress for 72 hours after laying it on a flat surface post removing the covers. During this time do not sit, lie or press your hands on the mattress. This way you are ensuring that you are giving it ample / extra time to inflate in every nook and corner of the top surface area as well as bottom layer. Just keep the doors and windows open and run the ceiling fan during inflation time for the smell to disappear faster. This mattress is one of the very few mattresses in the industry that offers relatively far better edge support. 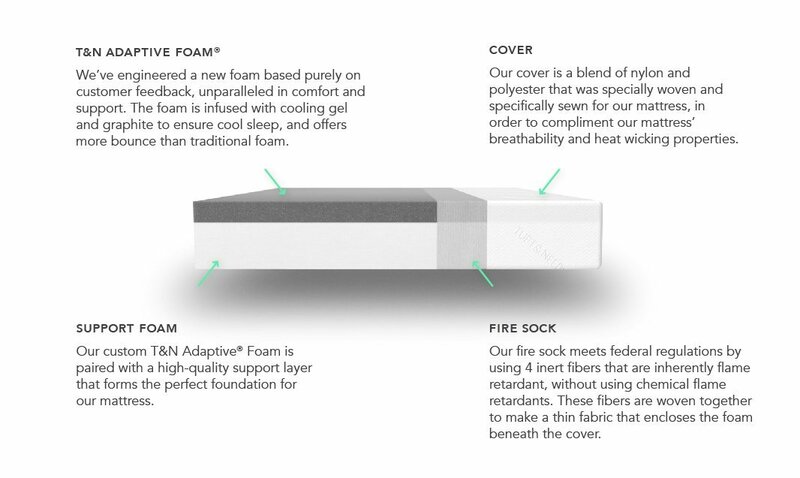 One primary reason could be the proprietary foam that Tuft & Needle has developed on its own. The mattress does not sink on the edges, unless you intentionally sit right on the corner of the mattress and try to push yourself down. Sleeping on the edges was also satisfactory; the mattress offered an even dip across the entire sleeping surface, even on the edges the sink was uniform and not uneven. It didn’t really sink abnormally on the edges as do many other memory foam mattresses. Even after 100 night sleep trial promise, the company's claim that the return percentage is less than 2% shows that performance of the mattress is truly top-quality. Drawn from several customer reviews, the customer service offered by the company is also exceptional. Why buy Tuft & Needle? With primary focus on providing better sleeping experience to a majority at an inexpensive price, T&N has employed one of the simplest of designs and proprietary foam. This foam is rather a meticulous blend of both latex and memory foam. If the performance had not been satisfactory, perhaps, we would not have really seen thousands of 4+ star verified purchase customer reviews & ratings on Amazon. Yes, the performance is extra-ordinary at the given price range as the company has designed the final versions after testing several iterations. T&N gathered feedback to make all minor and major changes to its prototypes before bringing out the final product that has surely met the expectations of majority consumers.